You can use the preview option having finished creating or editing a disclaimer. Preview option is used for previewing disclaimers within particular rules and for particular AD users to see what the final message will look like with the footer added. Fig.1. Preview button in the CodeTwo Exchange Rules 2003 toolbar. or in the new or existing rule wizard in the Rule editor dialog box (fig.2). 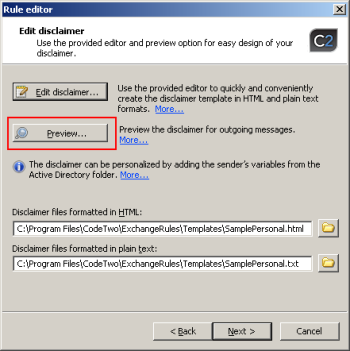 The new rule wizard is activated by choosing Add from the program’s toolbar, and the existing rule wizard is activated by choosing Edit. Fig.2. Preview button in the Rule editor dialog box. 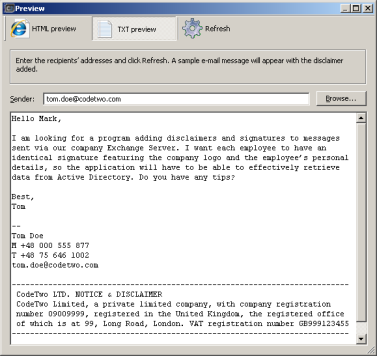 Preview function enables previewing messages including footers in HTML and plain text. The change of format is achieved by clicking Preview HTML (fig.3) and Preview TXT (fig.4) respectively. 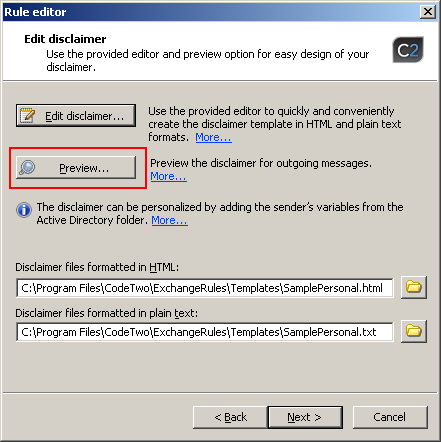 Preview function will prove exceptionally useful with personalized disclaimers including Active Directory placeholders. 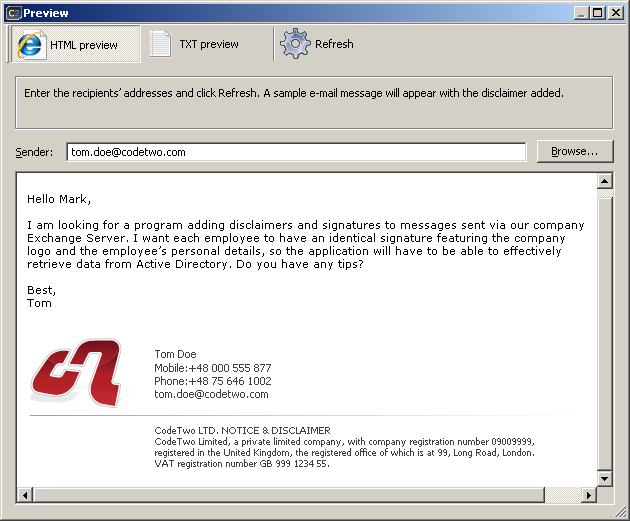 To check what the disclaimer will look like for a particular sender enter the sender’s SMTP address in the Sender field, or use Browse button to select the user’s object from Active Directory. When you have singled out the sender, click Refresh in the Preview screen toolbar. The placeholders will be dynamically replaced with Active Directory values. The message body including the disclaimer will display. Preview mode is available even if the rule we have chosen is not active for the sender’s address we have provided. This is due to the fact that the preview mode does not retrieve senders’ or recipients’ data from the rule (the server will not apply the rule to this senders’ address). To check the rules and disclaimers that apply to particular senders, see Test Rules. Fig.3. Previewing a message including a personalized disclaimer in HTML format. Fig.4. 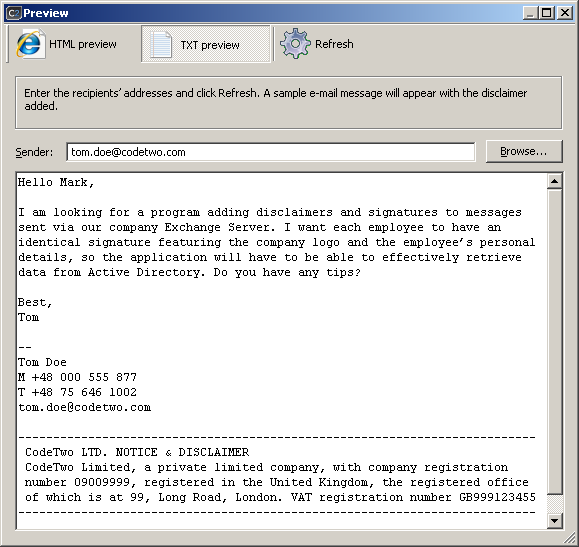 Previewing a message including a personalized disclaimer in plain text format.